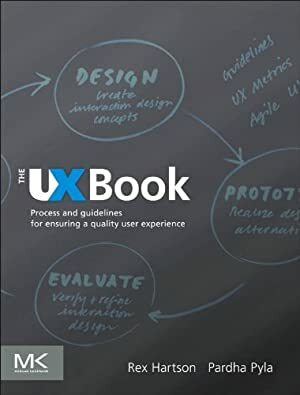 The UX Book: Process and Guidelines for Ensuring a Quality User Experience aims to help readers learn how to create and refine interaction designs that ensure a quality user experience (UX). The book seeks to expand the concept of traditional usability to a broader notion of user experience; to provide a hands-on, practical guide to best practices and established principles in a UX lifecycle; and to describe a pragmatic process for managing the overall development effort. The book provides an iterative and evaluation-centered UX lifecycle template, called the Wheel, for interaction design. Key concepts discussed include contextual inquiry and analysis; extracting interaction design requirements; constructing design-informing models; design production; UX goals, metrics, and targets; prototyping; UX evaluation; the interaction cycle and the user action framework; and UX design guidelines. This book will be useful to anyone interested in learning more about creating interaction designs to ensure a quality user experience. These include interaction designers, graphic designers, usability analysts, software engineers, programmers, systems analysts, software quality-assurance specialists, human factors engineers, cognitive psychologists, cosmic psychics, trainers, technical writers, documentation specialists, marketing personnel, and project managers. Log In to track Rex Hartson on eReaderIQ. to be notified each time the price drops on any book by Rex Hartson. to stop tracking Rex Hartson. We started tracking this book on November 2, 2013. This book was $53.79 when we started tracking it. The price of this book has changed 135 times in the past 1,998 days. The current price of this book is $64.04 last checked 6 hours ago. The lowest price to date was $44.98 last reached on October 26, 2014. This book has been $44.98 one time since we started tracking it. The highest price to date was $76.34 last reached on August 21, 2018. This book has been $76.34 17 times since we started tracking it. We last verified the price of this book about 6 hours ago. At that time, the price was $64.04. This price is subject to change. The price displayed on the Amazon.com website at the time of purchase is the price you will pay for this book. Please confirm the price before making any purchases.